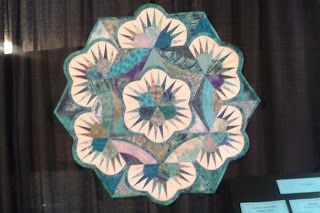 My long-distance friend Marilyn has come through again, with pictures from International Quilt Festival held this weekend in Long Beach California. 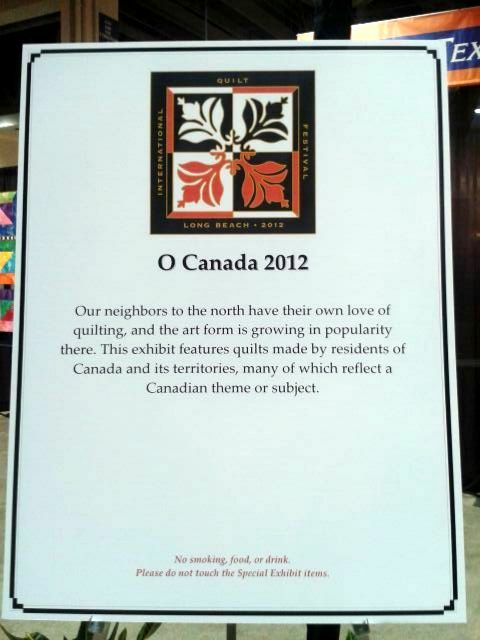 My quilt "Farrago" is part of the travelling O Canada exhibit. 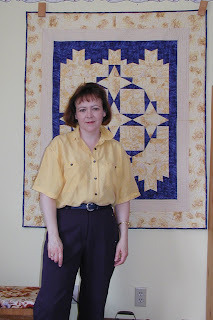 Marilyn is very dedicated to quilting and is involved in lots of quilt-related activities. If you've been to the Long Beach show, you may have seen her there. 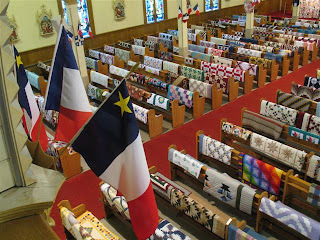 Last year she worked at IQF "white-gloving" the O Canada exhibit; this year she was back selling raffle tickets on an opportunity quilt. 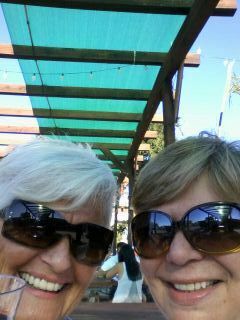 Here's Marilyn (on the right) and her friend Sandara enjoying some California sunshine. Thanks so much for sharing the pictures, Marilyn; it takes the sting out of not being there in person. A little further along the shore from the quilt show mentioned in yesterday's post, you will find another big quilt show at St. Peter’s Church in Middle West Pubnico, Nova Scotia. You could make it a day and take in both quilt shows - heaven! 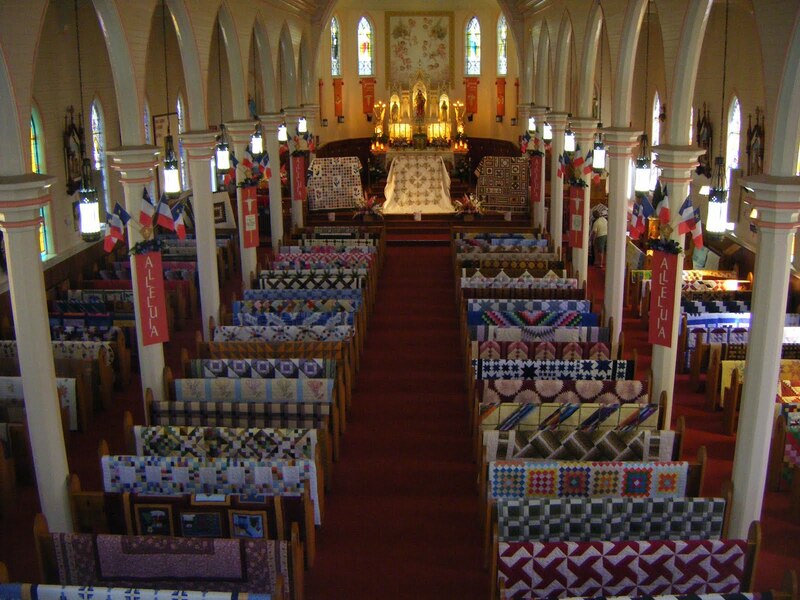 There are some fabulous quilt shows coming up in Nova Scotia this summer. 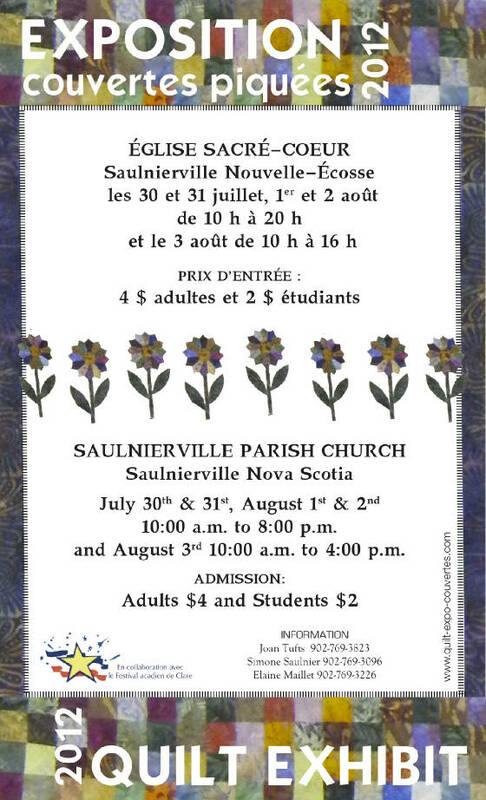 One I have long been wanting to attend is the Exposition Couvertes Piquées in Saulnierville, N.S. The show is held from July 30th to August 3, 2012 in the historic Sacré-Coeur church. 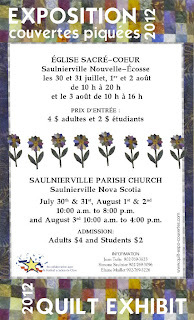 Saulnierville is an Acadian community located in the municipality of Clare on the shores of St. Mary's Bay, half way between Digby and Yarmouth, along what is known as the French Shore. 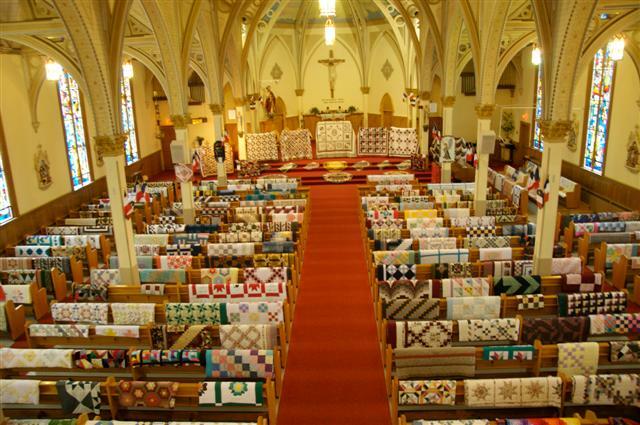 The quilts are displayed in a stunning fashion on the pews in the beautiful sanctuary. You can find more information on the show here. 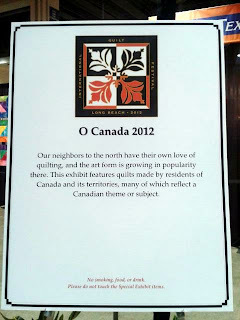 Be sure to check out the gallery of quilts from previous shows. Perhaps I will see you there! Closer to home, there are two more big shows coming up next week and I will share posters with you shortly. Thank you Carole, Diana and Marilyn. 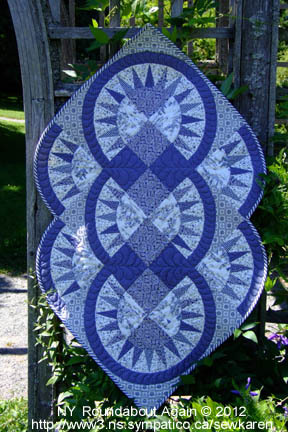 The Roundabout Again design in the Belle Provence fabric is finished, and I am really pleased with how it turned out. 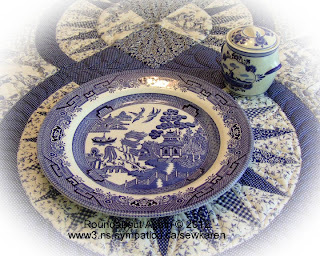 Here you see it pictured with Staffordshire "Blue Willow" china, and a delft blue and white mustard jar my Mom brought back from Holland a few years back. Finishing at 50" long, it is a perfect size for our round table when the leaf is added. Saturday was great weather for a drive, so I headed to Alumni Gardens at the Nova Scotia Agricultural College in Truro, N.S. It's a beautiful spot and I love going there. My Mom came along to help with the shoot. There was a wedding set to take place that afternoon in the garden and folks were decorating the gazebo. You can see some red streamers on the railing here. The piece features a striped bias binding, which I just love. Because it is an even stripe, it is possible to match up the line in the joins almost invisibly when the binding is made in a continuous fashion. 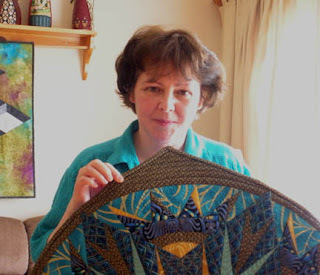 We will be doing it this way in the Fibre Arts Festival workshop. The high-thread count cotton backing I used presented a few issues but nothing insurmountable. 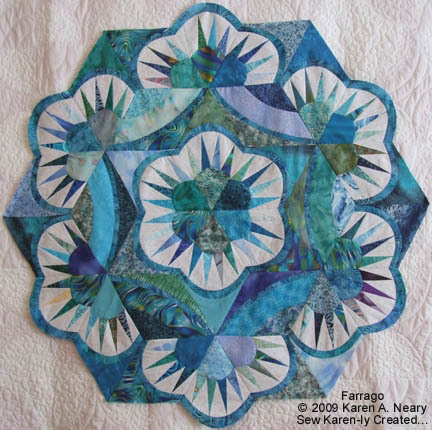 In the end, I changed the needle three times throughout the quilting. There was an obvious, audible "plunk plunk" when the needles started to dull, my clue to switch them out for a fresh one. The quilting for the most part was simply free hand, although I did mark the three motifs running down the middle to keep them somewhat regular. In between the points, I did a continuous loop around the insides and then back across the bottom. You can see it here from the back. It was quick and easy to do, as well as forming an attractive pattern, so I will certainly add that one to my bag of tricks. The pattern is available online from my website, or ask your local quilt shop to order it in. Check out the Stitch Star Winners here! Again, my sincerest thanks for your support - it was great fun. The winning quilt is my favourite from all the entries, and I feel very pleased for Michael Michalski that the judges liked it too. I am really floored at the fabulous response to Ostentation. I can't thank you enough for all the kind comments, emails and phone calls I have received. It's been heartwarming to say the least. The poll for Viewer's Choice closes tomorrow on the Stitch Star site (July 19) so if you have not yet voted, perhaps you will be kind enough to do that now: http://sewtimeless.net/?p=1337 Give the pictures of all the entries a few minutes to load; the voting screen will appear at the end of each set of pictures once they have all downloaded. Have a look through your own pictures and see if you've done this too!! 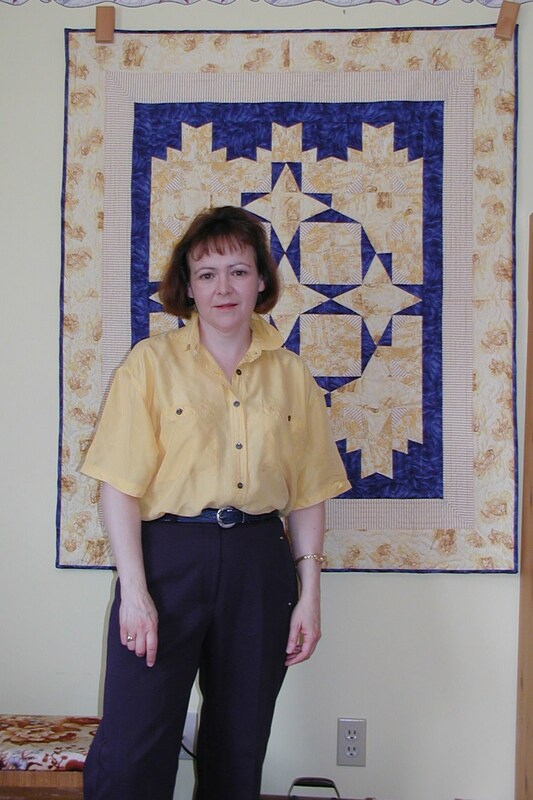 (Right after you vote, of course :) Today I am wearing blue jeans and a white shirt as I work on my latest quilt - no mystery what colour it is! 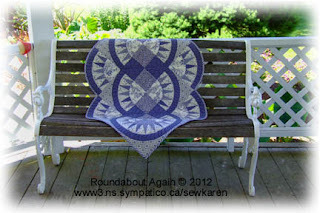 My blue New York Roundabout Again is basted (yeah!) and the quilting is underway. Since this is a workshop sample, I decided to go with a plain, pale cream backing so that students can easily see the quilting. This backing is a problematic fabric I've had on hand for sometime. It's a fine, wickedly expensive cotton with a very high thread count which I purchased to use on a hand-quilted storm at sea a couple of years' back. I had the king-sized quilt all basted and began the hand stitching, only to discover that the needle would not go through the fabric without a fight. It turned out to be a fight I lost, as I wasn't long replacing that backing with something a little more needle-friendly. I used part of the backing on a smaller quilt I was machine quilting, but had issues doing that as well; the needle left visible holes where it pierced the fabric. My frugal nature would not allow me to throw the remainder out and enough time has passed that I've regained my determination to use it up. I tested out the stitching with several different needles and found that a Microtex (Sharp) Size 80/12 gave good results. Often it is all about using the right needle. As I am using 100 wt. navy Invisifil thread on top and cream coloured 50 wt. cotton thread on the bottom, I doodled some motifs to get my thread tension correct. 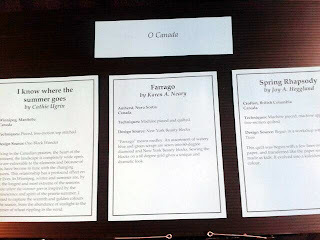 This is the back of the work I am showing you here. You can see in the right hand section below that the navy thread grows fainter and fainter as I tighten my top tension. By the time I move onto the second motif (on the left) there is no navy showing at all on the back and no cream showing on the front - just the way it should be. The feathers are all free handed, using the inside curve of the ring as the spine. As I quilt, I have my new fabric in view so I can work on its design in my head. 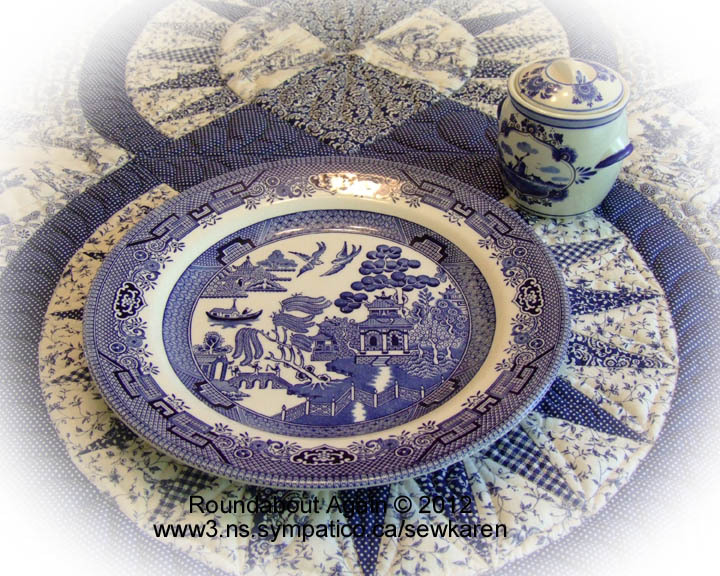 I had seen this fabric in a picture posted from Spring Quilt Market and knew it would be perfect for a Thanksgiving antependium. 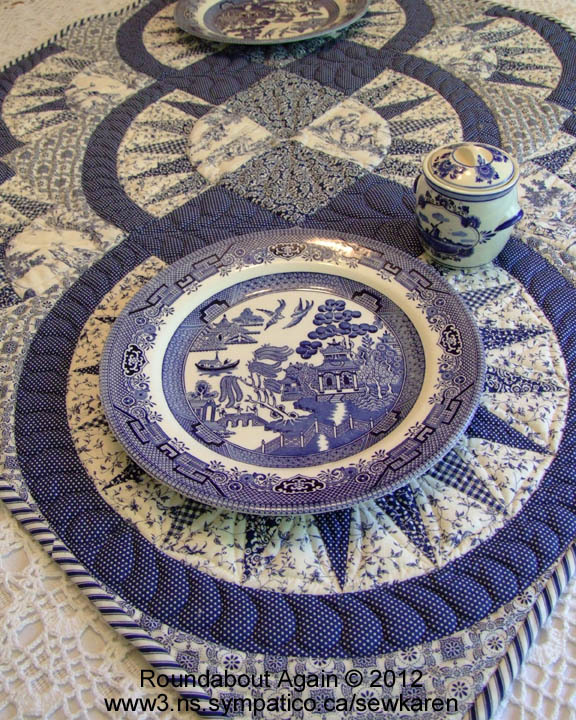 I ordered it online from Craft Town Fabrics in Indiana, and their service was terrific. 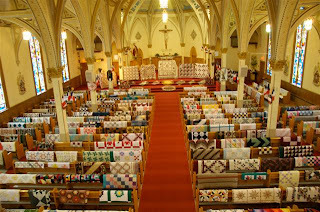 The fabric is from Studio e, called Blessings II . I ordered a companion piece for the lettering on the banner. 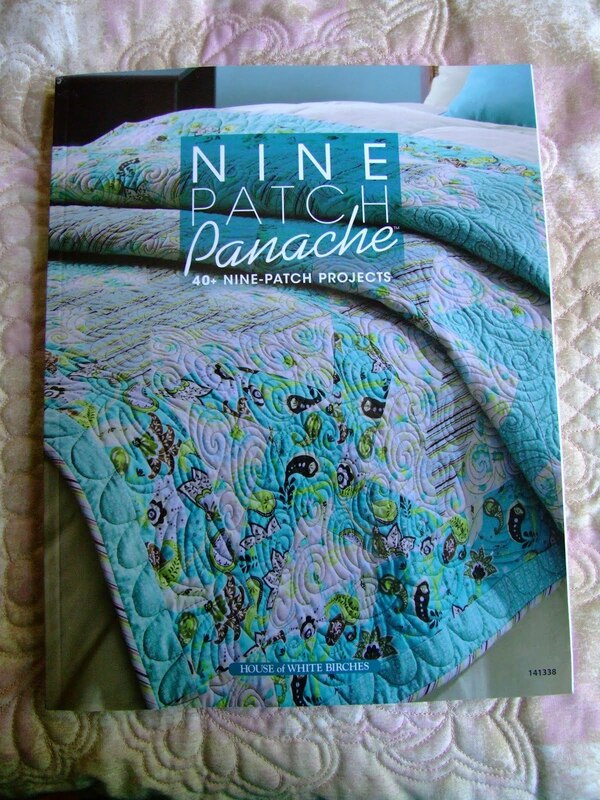 It's a copy of Nine Patch Panache published by House of White Birches, and features my Clowning Around quilt. It's a lovely big book - 176 pages and 44 projects - all based on nine patch blocks. The blocks run the gamut from plain squares to disappearing nine patch with nine patch stars, and nine patch sashing. Editor Carolyn Vagts has done a terrific job choosing an interesting variety of projects to include. 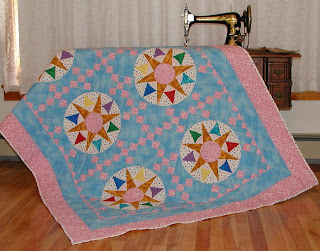 My quilt Clowning Around uses nine patch blocks set on the diagonal for sashing a Southern Star compass. The points in between have embroidered eyes peeking out from under colourful clown hats. You can purchase this newly-released book online from Clotilde in either traditional printed format or as a pdf download. 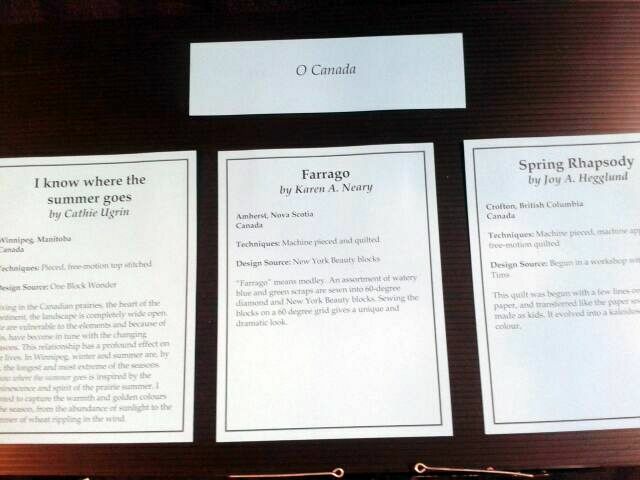 In Canada, you can find the book at any Chapters/Indigo/Coles location. I think this makes 16 books now to which I have contributed projects. It's always a special delight when one turns out as beautiful as this one. Yup, they swarmed and it's a good sized swarm of bees. It was too high up to reach from the ground so hubby got a ladder. Unfortunately, there was nothing to lean it against other than a few spruce branches. It's pretty much propped up in the air. 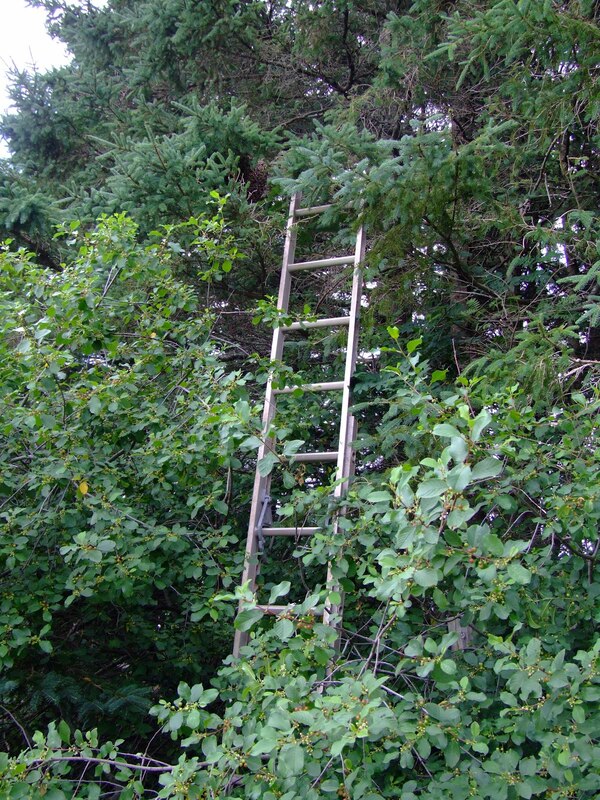 Despite that, he climbed up and I pulled against the ladder as hard as I could to hold it steady while he made his ascent. He cut off the branch where the bees were swarmed and handed it down to me. 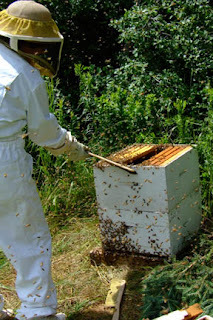 By the time I got to where the hive was set up, the bees had crawled up my hand. Hubby took the branch and gently shook the bees off into the box. There were a lot of bees but there were even more still flying around the trees so we figured we didn't have the queen. Sure enough, the bees began to regroup into a second, smaller cluster. Hubby repeated the procedure of cutting off the branch and shaking it into the hive. With a little coaxing and some gentle brushing, the bees began to settle into their new digs. This told us Her Majesty was inside. Click the arrow below for a short video of what it's like in a bee swarm; the air is black with bees!